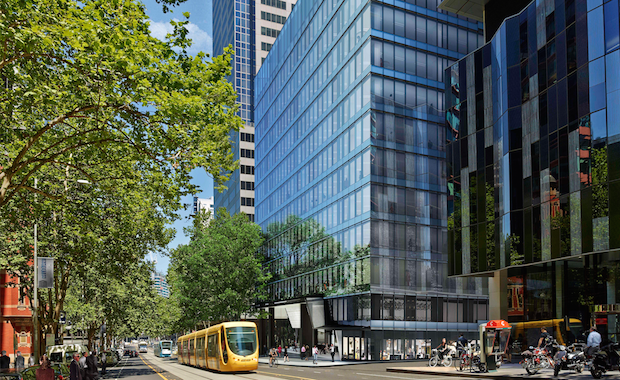 Charter Hall has started construction on the largest vertically connected office space in Melbourne’s CBD. 570 Bourke Street is owned by Charter Hall’s Core Plus Office Fund (CPOF) and will see the re-development of a key Melbourne CBD site, providing 28,000 square metres of contiguous office space across 11 levels. One of the key features of 570 Bourke project is its light-filled glass atrium that cuts through all 10 levels to create a light and bright office space that encourages collaboration through its inter-connecting stairways. Charter Hall CPOF fund manager Chris Forbes said the glass atrium creates the largest vertically integrated floor plates available in the CBD. At 2,700 square metres per floor he said tenants would be able to comfortably accommodate more than 270 employees on each level, improving connectivity and reducing occupancy costs. “Space efficiencies gained from large floors usually come at the expense of amenity in Melbourne. 570 Bourke is unique because it provides the space we know tenants crave, but in an already thriving and established part of the city,” Mr Forbes said. Knight Frank National Director of CBD Leasing Hamish Sutherland said that tenants seeking these large floor plates were also attracted to the smaller high rise floors which provide flexibility for future expansion. “We usually only see floor plates of these sizes outside of the CBD where the option to expand within the building is not typically available,” Mr Sutherland said. Charter Hall aimed to create an office environment that would provide the physical and technological needs of businesses whilst also enhancing the experience for their staff. End of trip facilities cater to 300 cyclists and runners and expansive rooftops on level 12 will provide staff on those levels with opportunities to enjoy the outdoors at work. “570 Bourke’s design intentionally incorporates lots of light and space, resulting in a refreshing environment that will boost people’s outlook at work, while complementary lifestyle features will encourage the pursuit of a positive work-life balance.” Mr Forbes said. A total of four new retail tenancies will also be added to activate the surrounding street and laneway frontages and enhance the new Bourke street lobby. Construction by Brookfield Multiplex has commenced with completion expected in mid 2015.